So, who am I? Well, it’s hard for me to put into words who I am. I don’t stop to dwell on it, I just do it, be it, AM it. But… *I’m an educator at heart–it’s in my blood. From an early age, if I learned it, I told it. Always curious, asking why, learning and sharing. It’s what I do. *I’m a highly emotional person–lately I’ve identified that as “passion”, and that it’s a good thing. I care deeply about many things–that is also “passion”. *I’m a late-life mom to two amazing and adorable (adopted) children who have physical, mental, and psychological differences from “typical” children. *I’m in my “Sensational Sixties” and a bit of a crazy woman. *I love to tell a good story–so I’m writing to see how those stories come out. I hope you enjoy them, and learn something along the way. 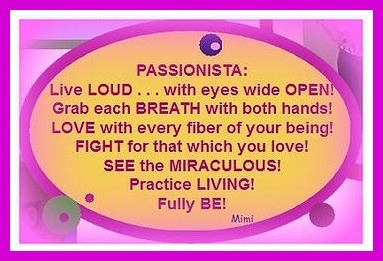 Please visit my website http://www.passionistaatlarge.org/ to see more about me, and perhaps invite me to speak for your group!